Support small farmers at the Bengaluru Marathon. Under The Mango Tree (UTMT) promotes beekeeping to enhance incomes, increase agricultural productivity and improve rural livelihoods. Our work with marginal and tribal farmers, in some of India’s poorest districts of Gujarat, Maharashtra and Madhya Pradesh has improved agriculture yields by 50% through increased bee-pollination and rural farming incomes by 40% through increased yields and sale of honey. This initiative has received wide recognition for its innovative and farmer friendly approach including the prestigious Development Marketplace Award of the World Bank in 2013. The 'Bees for Poverty Reduction' programme works with the indigenous bee, creates a local cadre of village based Master Trainers to support farmers and provides market access for the honey and beeswax generated. In addition, it also promotes other livelihood activities around the beekeeping-honey value chain, by training village level community organizations and Self Help Groups toprovide inputs and other services that ensure sustainability. The programme has to date trained 3000 farmers in beekeeping and is poised to scale up reaching 50,000 marginal farmers by 2020. 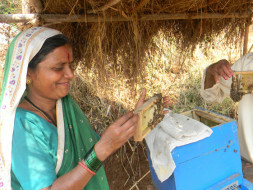 Help us reach out to 50 more marginalized farmers in Gujarat, in the districts of Valsad, Dangs and Silvassa (UT of Daman) and provide them with beekeeping starter kits (2 bee boxes, 1 swarm bag and 1 bee veil) and handholding support for one year.